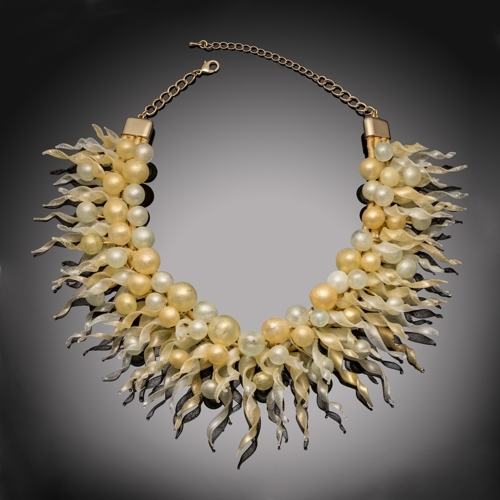 I've entered 2 necklaces into Embodiment - a juried jewellery and wearables exhibit organised by the Pittsburgh Glass Centre and 3 Rivers Glass Beadmakers (USA). The idea for my lastest piece happened after seeing a Dale Chihuly chandelier in Harrods, London. His pieces always inspire awe and wonderment on how they are made, the shapes and colours and cohesion that bring them all together. Once I have the initial idea, then becomes the task of design and mechanics. I start by playing with shapes and colour experimenting until I get the right combination. Then becomes the assemblage, which grows and evolves as I get the feel for the piece and how it looks, that magic moment when it all comes together and I am satisfied. Although am I satisfied? Forever a perfectionist, there is always something in me that wants to tease and tweak, the voice inside that asks - is it good enough? Could it be better? This is what drives me to continue my journey in glass. Named for the Greek sun god Helios, crowned with a golden aureole. 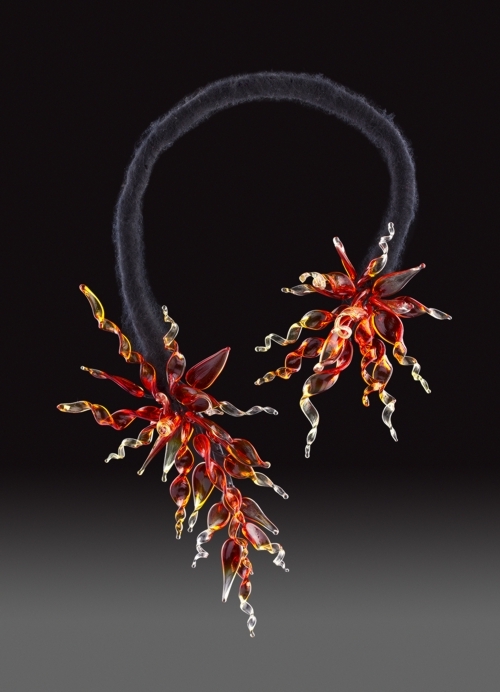 This is the fourth in a series of necklaces inspired by he works of Dale Chihuly. The glass used is re-cycled off-cuts of picture frame glass. Each piece of the necklace is made by melting the glass onto a piece and wire and then coated with mica powder in various shades of gold. Using the flame the piece is then manipulated to form the shape desired. I didn't want the piece to be too heavy so each of the balls are hollow. The necklace is assembled using techniques found in floristry, the same as would be used in a tiara or headdress. The second piece I've entered is this necklace title Fire. It is the third in a series of pieces designed by me after coming across a sculpture of the glass artist Dale Chihuly in Murano, Venice. It was the first time I had seen his work since becoming a flame worker myself and understanding some of the complexities of working with glass gave me a new appreciation of his work that I hadn't had before. I began exploring ways to create miniature versions of his works and combining them with my skills as an ex-florist started creating this series of necklaces. The feeling of completeness that working with glass gives me is like no other I've experienced before. Made using Plowden and Thompson glass. Each component created by melting glass on a piece of wire and then manipulating it in the flame to create form and colour. Then annealed in the kiln to reduce stress. The necklace has been assembled using floristry skills similar to that of creating a tiara or headdress and then the mechanics hidden using needle felting wool.